Through a partnership with Immersive Technologies, Ma’aden and Missouri S&T, hundreds of mining operators will be trained annually at Saudi Arabia’s first specialist training institute for the mining industry. Missouri S&T, a long-time customer of Immersive Technologies, signed an agreement with Saudi Mining Polytechnic (SMP), originally established by Ma’aden, and the Technical Vocational Training Corporation (TVTC) of Saudi Arabia, to provide mining training programs. 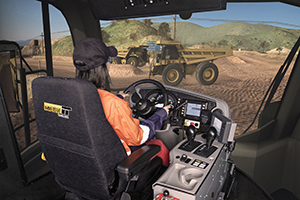 Missouri S&T will utilize Immersive Technologies’ simulators in their training programs. 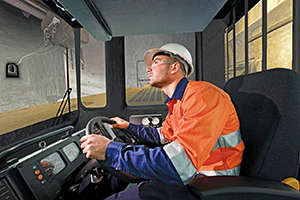 The investment includes 7 Advanced Equipment Simulators and 18 simulator modules (Conversion Kits®) for both surface and underground mining. Saudi Arabia marks the 35th country utilizing Immersive Technologies’ simulators. “Ma’aden has a solid reputation for investing in the best technology and we are honored to be part of their workforce development solution,” says Peter Salfinger, Chief Executive Officer at Immersive Technologies. “Our simulators will support Ma’aden and the Kingdom of Saudi Arabia in training their young people to further develop mining as a solid pillar of the Saudi economy. The Saudi Mining Polytechnic will build a foundational workforce for Saudi Arabia to become a sought after place for global miners to invest and for Ma’aden to become even more prominent on mining’s global landscape,” says Salfinger. Representatives from Ma’aden visit the Immersive Technologies stand at MINExpo 2012 in Las Vegas. The training investment from Ma’aden includes mining equipment simulators designed for surface and underground hard rock mining. Ma’aden is a leading mining and metals company in the Kingdom of Saudi Arabia, with a diverse portfolio of mineral assets at various stages of development including: exploration, development and production. Ma’aden has a broad commodity focus spanning gold, zinc, phosphate, aluminum, and industrial minerals, it is continually assessing opportunities to enter into new commodities that demonstrate strong long-term fundamentals and opportunities for growth, in line with their strategy. Missouri S&T is one of the top five technological research universities in the United States and is well known internationally for its engineering, science and technology programs. Missouri S&T has the largest and the most diversified mining engineering program in the United States. The program offers the B.S., M.S., M.E., Ph.D. and D.E. in Mining Engineering and M.S. in Explosives Engineering with a current plan to offer the Ph.D. in Explosives Engineering and M.S. in Mineral Process Engineering. Mining Engineering at Missouri S&T is well recognized internationally with academic partnerships with several universities in Australia, Brazil, Botswana, China, Ghana, Indonesia and Mongolia. Missouri S&T was selected to be a partner with the Technical and Vocational Training Corp. (TVTC), a Saudi government entity, and the Saudi Arabian Mining Co., Ma’aden, to establish the Saudi Mining Polytechnic (SMP) given its strong track record of excellence in mining engineering education and its global renown. Under the agreement, Missouri S&T and its industry partners will train personnel at SMP for the mining industry sector of the Kingdom.